Matt Noferi recently set a new Kiama Game Fishing Club record with a 414kg mako caught on an epic mission aboard Matt’s boat Ziphias. Leaving Port Kembla harbour at 7am, Matt and friend Tim Monck headed out to a temperature break 29 miles off the coast in 1000 fathoms. Upon arrival the duo were greeted with birds everywhere, bluebottles floating in the current and blue phosphorescence in the clear, bluewater: all signs of a good current, rich with plankton, confirming this was the place to fish. They deployed a sea anchor, put a livebait and a cube-bait out on the surface, and set a very deep bait, 450m down, aimed at a swordfish. The deep bait was half a slab of fresh bonito on a 24kg Tiagra outfit rigged with 15ft of 300lb mono leader, a heavy homemade sinker and two light-sticks. Two hours later they had a 60kg yellowfin under the boat eating berley cubes, but refusing all of their offerings. It stayed with them for over an hourand- a-half … right until the deep reel started to scream. As soon as Matt picked the rod up and got stuck into the fish it dove straight down at such a blistering pace that Matt thought he was going to get spooled vertically! Thankfully, there was about 80 metres of line left on the reel when the fish stopped running. From the depths, it slowly started to come up, lifted inch by inch with Matt using a mixture of high- and low-speed gears on the Tiagra. Suddenly the angle on the line was changing and Matt felt a big burst of speed – the fish was going to jump! About 400m behind the boat, a mako of unbelievable size launched 25 feet into the air, flipping end-over-end. They could not believe the size of it. The girth on it combined with the height of its dorsal fin and the width of its pectoral fins was frightening. From that point it was a further 3.5-hour fight, which included some surface and deep runs, before they had the mako on the surface again. The duo agreed that they were going to take this fish, as it was truly an exceptional specimen, one that they might not see again in a lifetime of fishing. It was at that point they realised that they had no tail rope and only one eightinch flying gaff to try to secure this monster! Each time they got the shark alongside they had only seconds for Tim to let go of the steering wheel, run out of the cabin and try to get a gaff shot before the shark dove under the boat to avoid the gaff. To make things worse, having a mono leader prevented them from pulling on the leader, as one nick on a tooth would have seen this magnificent fish lost for ever. Luckily, Tim managed to plant their gaff halfway between the dorsal fin and tail, but the mako dove, ripping the rope out of Tim’s hands and pulling the corner of the boat down. After letting the shark settle, Tim slipped the tail rope on and secured it to the bollard. 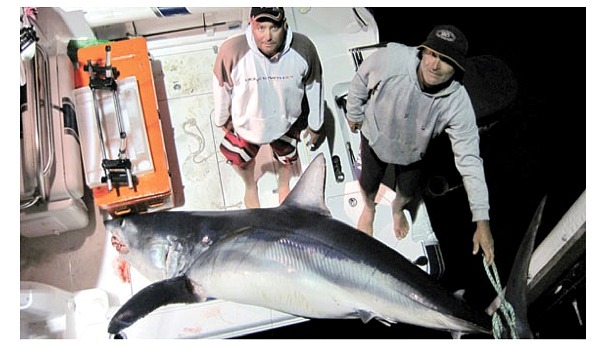 At that stage the mako started going crazy, so Matt drove the boat forwards, towing the secured shark backwards. They then worried that the shark would tear out the boat’s bollards – but it all held together.